Enjoy this original and authentic recipe for Austrian Krapfen, a pastry that is very popular in Austria, Switzerland and Germany. In Germany we call it Berliner. 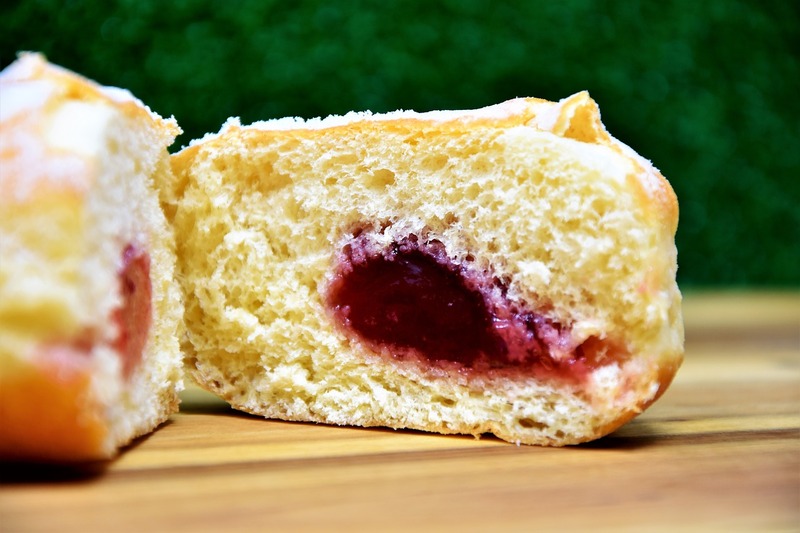 The pastry is filled with jam or sometimes with a vanilla custard. It is not difficult to make. Happy Baking! - Sieve the flour into a bowl and make a mold in the middle. - Mix cold milk with warm water (water should be semi-warm, not hot! as it will make the yeast unusable). - Add yeast and dissolve it. Pour the yeast mix carefully and slowly into the mold. - Take some flour from the edges and add to the liquid and mix lightly until you have a soft dough. Sprinkle this dough with some flour and cover with a kitchen cloth, let rest and rise at a place with room temperature (can be somewhat warm) for 30 min. - If you see that the volume of the dough became bigger and there are some cracks visible, then you know that the dough is ready for the next step. - While dough is rising beat the soft butter until foamy, mix egg yolks, eggs, sugar, vanilla sugar, salt and rum and add to the butter. - add this mix to the yeast dough and use remaining flour, knead until uou get a smooth, satin like dough. Cover dough and let rest at a warm place for another 20 min. - Sprinkle baking board with flour. Roll dough and cut about 40 pieces. - Form round and smooth Krapfen from each piece or cut them out eg. with a round glass or a cookie cutter. - Use the hand to cover the whole dough piece and with a light pressure make round movements on the baking board until you get a smooth ball. - Place the Krapfen on a floured board and press it somewhat flat. Cover them with a kitchen cloth and let rise at a warm place for 20 min. - In a deep fryer heat the oil to 170 C or 350 F - Use only taste neutral oils such as expeller pressed refined coconut oil, soy oil or canola oil. - When the oil is hot slip the Krapfen carefully into the oil, the upper side first. - Cover the deep fryer. - After 3 min turn the Krapfen and fry for another 3 more minutes without the lid. This will create the nice white edge around the Krapfen. But the Krapfen dough needs to rise as given in the instructions. 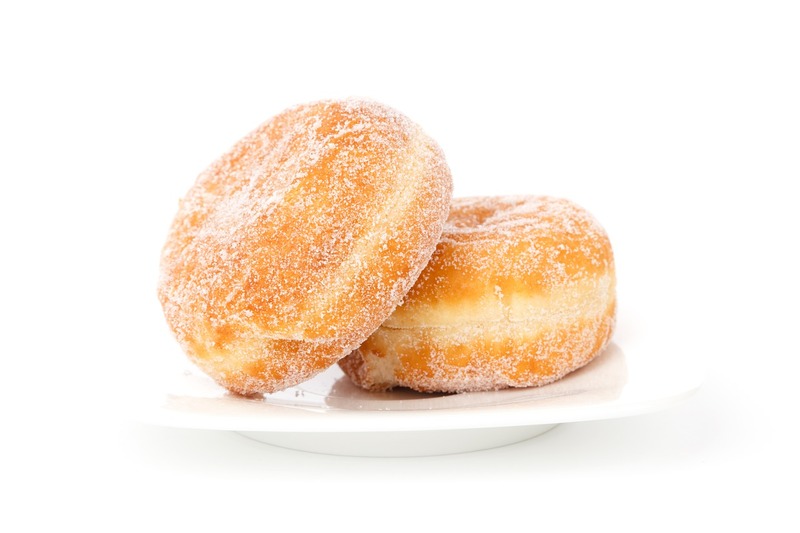 If rising time was too short the Krapfen will be more like a ball without any white edges. - Place each one on kitchen paper. - Let them cool of a bit. - Fill jam into a decorating or piping bag that has a very pointy nozzle. 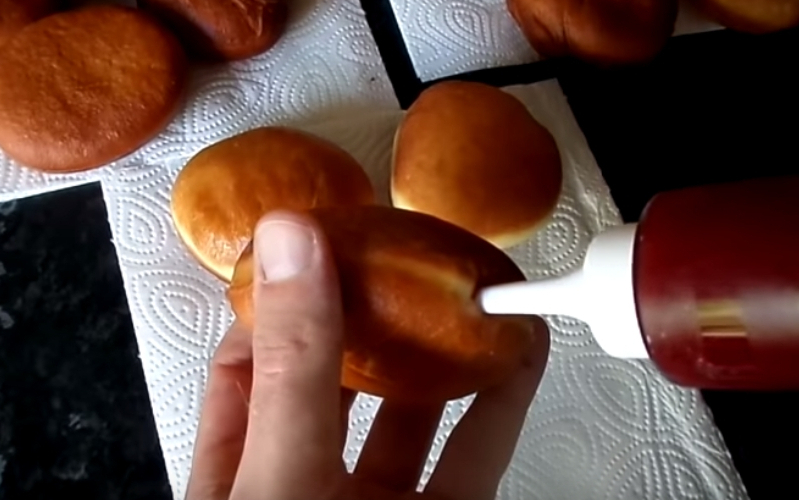 - Inject a small amount of jam into the Krapfen.